violence with dignity and peace. Atypically for the guest speaker at Harvard’s Commencement afternoon exercises (the annual meeting of the Harvard Alumni Association), Lewis already has his Crimson honorary degree. His selection to speak this year is doubly timely. First, these will be the final exercises led by Drew Faust, since she steps down as the University’s twenty-eighth president effective June 30. As she has made abundantly clear, the struggle to achieve African Americans’ civil rights has been foundational to her beliefs in diversity and inclusion throughout her life (read about her childhood reaction to resistance to Brown v. Board of Education in then-segregated Virginia)—and Lewis has been an inspiration for much of her life. Faust spoke about Selma and John Lewis at Morning Prayers in 2015—before traveling to Alabama to join the fiftieth-anniversary commemoration of the voting-rights march in Selma (in which she had participated as a 17-year-old college freshman, skipping her midterms). She invited him to campus in April 2016 for the ceremony acknowledging Harvard’s connections to slavery, during which a permanent plaque recalling Titus, Venus, Juba, and Bilhah—enslaved people who lived and worked for the Harvard presidents who resided at Wadsworth House—was affixed to that building. 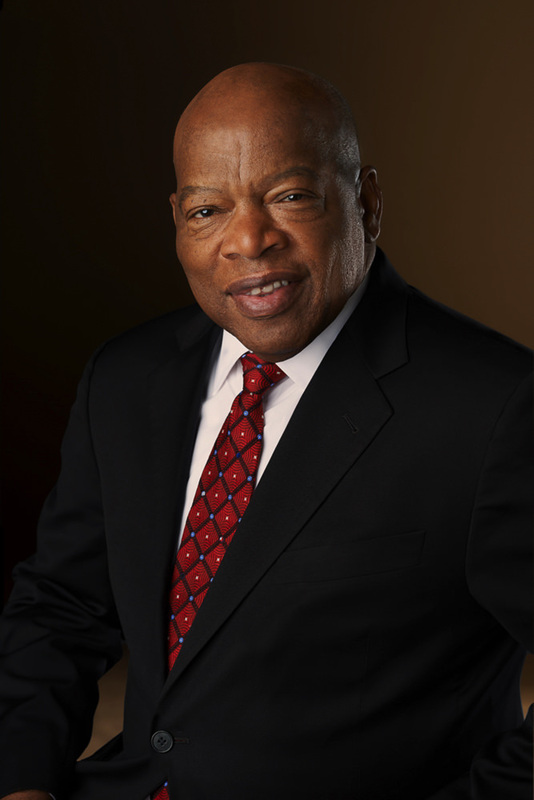 Speaking then, Lewis said the nation’s people “have gone to great lengths to wipe out every trace of slavery from American memory,” in the face of 400 years of voices calling out to be remembered. “We have been tossing and turning for centuries in a restless sleep,” struggling with those memories. But, “We are a people haunted by amnesia,” because “we just can’t summon the truth of what it is.” Harvard’s recognition of its slave past, he said, was an act of “keeping the faith by giving these souls some of the dignity and honor they did not receive in life but have deserved for centuries.” Faust recalled that day with some emotion during her Baccalaureate address that May. And last November, at a Harvard Campaign gathering of Harvard alumni at the Smithsonian Institution’s National Museum of African American History and Culture, in Washington, D.C., she invited Representative Lewis to speak about education as a civil right. For more than 50 years, John Lewis has dedicated himself to the ideals of equality and decency, standing up for what is right, even when it meant putting himself in harm’s way. His public-service legacy is unparalleled, and he is an inspiration to me and to countless other people across the United States and around the world. For me, as for millions of black Americans, there is a special dimension to our national crisis. We are not only caught up in all the evils of contemporary society, we are its lowest and most deprived component. For most of us this is not a society of abundance but a society of want. We are not newly victimized by the loss of identity and alienation. We have suffered an imposed heritage of exclusion and frustration for generations. Our future is doubly bleak as we face the unabated racism and deepened deprivation reserved for black Americans. [I]n struggling to give meaning to your own lives, as students you are preserving the best in our traditions and are breaking new ground in your restless search for truth. With this creative force to inspire all of us we may yet not only survive—we may triumph. Commencement oratory, of course, is especially vulnerable to dating and disappearance into the ether. In King’s text, it is possible to discern the sentiments that animated John Lewis, lion and survivor of the civil-rights movement, and perhaps some of those values that the young Drew Faust imbibed in her own earliest college years. And though the precise circumstances have changed, some of the issues remain very much with Americans today.